China's rise over the past several decades has lifted more than half of its population out of poverty and reshaped the global economy. What has caused this dramatic transformation? In China's Great Migration: How the Poor Built a Prosperous Nation, author Bradley Gardner looks at one of the most important but least discussed forces pushing China's economic development: the migration of more than 260 million people from their birthplaces to China's most economically vibrant cities. 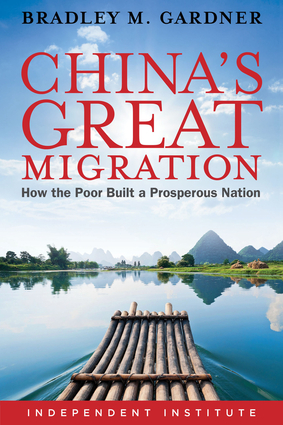 By combining an analysis of China's political economy with current scholarship on the role of migration in economic development, China's Great Migration shows how the largest economic migration in the history of the world has led to a bottom-up transformation of China. Gardner draws from his experience as a researcher and journalist working in China to investigate why people chose to migrate and the social and political consequences of their decisions. In the aftermath of China's Cultural Revolution, the collapse of totalitarian government control allowed millions of people to skirt migration restrictions and move to China's growing cities, where they offered a massive pool of labor that propelled industrial development, foreign investment, and urbanization. Struggling to respond to the demands of these migrants, the Chinese government loosened its grip on the economy, strengthening property rights and allowing migrants to employ themselves and each other, spurring the Chinese economic miracle. More than simply a narrative of economic progress, China's Great Migration tells the human story of China's transformation, featuring interviews with the men and women whose way of life has been remade. In its pages, readers will learn about the rebirth of a country and millions of lives changed, hear what migration can tell us about the future of China, and discover what China's development can teach the rest of the world about the role of market liberalization and economic migration in fighting poverty and creating prosperity. Bradley M. Gardner is a Research Fellow at the Independent Institute and a Foreign Service Officer with the U.S. Department of State, currently serving in Nepal. Prior to joining the Foreign Service, he worked as a Research Analyst with the China office of The Economist's Intelligence Unit, covering regional economics, finance-sector reforms and international trade. He has also worked as Managing Editor of China International Business and Editor-in-Chief for China Offshore/Invest In at Mx Media, as well as covering the financial sector and economic policy for the Czech Business Weekly in Prague, Czech Republic. Bradley holds a M.A. in humanities from the University of Chicago and a B.A. in Chinese from the University of Southern California. In rare moments between travels, he and his family live in California.